Mr. Olgierd Danielewicz is a graduate of Adam Mickiewicz University in Poznan (Master degree in Management and Marketing) and Academy of Economics in Wroclaw (postgraduated studies and MBA). He joined AmRest (ARS) as a student in 1998, taking up the function of Assistant Manager of soon to be opened KFC restaurant. 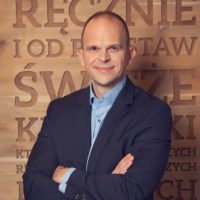 Afterward he held the position of General Manager, Area Trainer (responsible for training in both KFC and Pizza Hut in Western Poland), Area Coach of KFC South 1 region and District Coach (taking over responsibility for few regions of KFC operation). In 2007 Mr. Danielewicz was given a challenge of relaunch of Burger King in Poland. The opening of Burger King Złote Tarasy has been recorded as one of the best Burger King openings ever. Next step in his career was the coming back to his home brand and taking over the Brand President position for KFC, initially in Central Europe division, currently in all markets of AmRest operation. He is responsible for development, monitoring of financial performance and image of the KFC brand.